Journey, runner-up in last year's QIPCO British Champions Fillies & Mares Stakes, went one better today when landing the Group One race in great style. The 4/1 chance won by four lengths and a neck from Speedy Boarding and Queen's Trust, and when returning to the winner's enclosure was dismounted by Frankie Dettori in his own aerial way. Trainer John Gosden said: "I said to Frankie, 'just try to settle where you can and she'll tell you when she's happy, and he rode her beautifully. She showed great acceleration - she was just caught out last year when the ground was just too soft, but it was a marvellous effort given that she was beaten by the St Leger winner, Simple Verse. "She's a fabulous filly and has beaten an exceptional filly in Speedy Boarding, who won the Prix de l'Opera just 13 days ago. She is a bit quirky at home - she's one of those fillies that you don't argue with. She's got her mind set on what she wants to do and you go with her - if you try and impose your will upon her she will quickly tell you what to do." Gosden is into the final few weeks of the season as champion trainer before the crown moves to Aidan O'Brien. The reigning title-holder said: "We've had a great season with plenty of good winners, but you don't have a Golden Horn every year. I'd say he was the best horse I've trained in my life and I was lucky to have him. Someone called Aidan O'Brien has had a very good season this year and we've all been looking in the shadow of the Colossus. 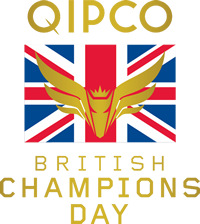 We've lots of promising two-year-olds, and that's the nature of the game - you are only as good as your horses and it's nice to come here and win on QIPCO Champions Day." Gosden's Shalaa ran disappointingly in the QIPCO British Champions Sprint, and Gosden said: "He was injured in the Spring, and while he came back steadily and won here recently it was only two weeks ago. It was the only race to run in and he needed a race, but then to come back here a little too quickly he over-raced. If you watch the film look at the jockeys' feet - Frankie's heels were down because he was trying to say 'whoa, take it easy'. 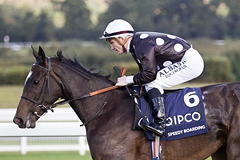 He has tons of speed and is a gorgeous horse." James Fanshawe's Speedy Boarding (14/1) finished an excellent second under Frederik Tylicki. The four-year-old daughter of Shamardal travelled kindly in the one mile and a half Group One contest and kept on gamely in the home straight to finish four lengths behind runaway winner Journey. Speedy Boarding has run with credit all year and backed up her excellent victory at Chantilly in the Prix De L'Opera with her placed finish today over a longer trip. Fanshawe who won the second race of the day, the QIPCO British Champions Sprint Stakes with The Tin Man, said: "She has continued to improve with every run. It is always tough to come back after a hard race like she had last time in the Prix de L'Opera at Chantilly. "She seemed very bright in herself coming into the race and she has run a really great race." 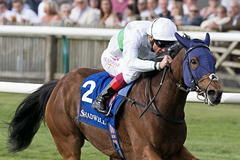 Fanshawe was unsure about future plans for the mare who may be retired. He remarked: "The owner (Helena Springfield Ltd) wants to retire her because of the appeal from a broodmare perspective but from a trainer's perspective, I want her to stay in training because she has so much scope." Tylicki added: "It was an unbelievable run from this filly. What a fantastic training performance from James. "She only got beat four lengths by a very good horse. She proved to everyone that she could stay the trip. "I thought she was a little bit under-rated and underestimated coming into this race today and she has showed she is a top class filly."